"There's millions and millions of sad walls and the world is our canvas." Graffiti is on the rise in Southern California. In the city of Los Angeles alone, requests for removal are up 64 percent over the past five years. But Santa Monica-based Beautify Earth is empowering street artists to use their talent to help end urban blight. "Artists are people who can use the support to do something positive and create the next renaissance of our planet," said Beautify Earth founder Evan Meyer. The nonprofit is dedicated to turning urban blight into colorful murals. What started as a grassroots movement along Lincoln Blvd. in Santa Monica has grown to a nationwide collective of street artists who are changing the face of the world-- one mural at a time. "There's millions and millions of sad walls and the world is our canvas," said founder Evan Meyer. 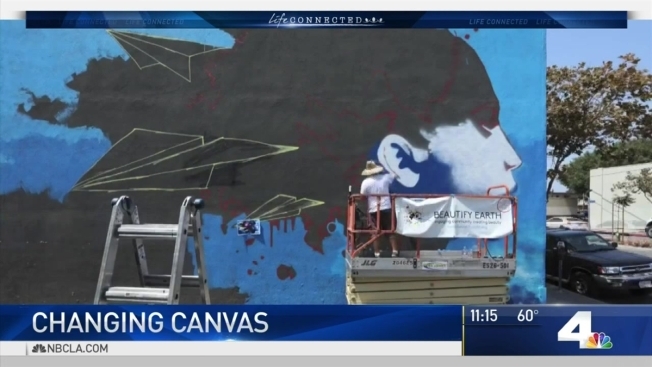 Businesses can donate their walls and community members can sponsor a project, giving artists like Marcel "Sel" Blanco a chance to share their talent. "There's a lot of ugliness in the world, so if I can put up a little beautify, I feel good," said Blanco. It might also keep new graffiti artists out of trouble. Back in the 1980's, Blanco was a rebellious teenager who got kicked out of school for illegally spraying graffiti. He relates to young artists who are frustrated by not having an outlet for their artform. Blanco said, "The more I see them pull art out of school, the more graffiti I see up. A creative mind is going to express itself one way or another." He eventually graduated and went to art school, where he came to realize his creativity wasn't a crime. "It finally felt like I wasn't insane. When i went to art school I met people who had that in common. They were outcasts left out of school with a different way of thinking." He has gone on to paint dozens of murals around Southern California since he linked up with Beautify Earth, lifting spirits of countless people along the way. "People come up and say thanks for putting this here, now i have pride in the community. They didn't before," said Blanco. He said he hopes young artists will capitalize on the support Beautify Earth provides. Blanco Said, "Instead of just putting your name up you could put a whole piece up and not sneak out at night. Take your time with it, grow as an artist and see what you can do." Graffiti is on the rise in Southern California. In the city of Los Angeles alone, requests for removal are up 64 percent over the past five years. But Santa Monica-based Beautify Earth is empowering street artists to use their talent to help end urban decay. The nonprofit is dedicated to turning urban decay into colorful murals. What started as a grassroots movement along Lincoln Boulevard in Santa Monica has grown to a nationwide collective of street artists who are changing the face of the world — one mural at a time. The left side of this photo depicts the current state of this building; the right side depicts a rendering of what the completed mural will look like. A mural dedicated to #Climate Awareness. We have partnered with artist @trekthunderkelly and TheClimate Mobilization.org to bring this mural to life as a beacon toward change. Link to the crowdfunding site and all the wonderful details about this project is in our bio. Thank you. "There's a lot of ugliness in the world, so if I can put up a little beauty, I feel good," Blanco said. It might also keep new graffiti artists out of trouble. Back in the 1980s, Blanco was a rebellious teenager who got kicked out of school for illegally spraying graffiti. He relates to young artists who are frustrated by not having an outlet for their artform. "The more I see them pull art out of school, the more graffiti I see up. A creative mind is going to express itself one way or another," he said. He has gone on to paint dozens of murals around SoCal since he linked up with Beautify Earth, lifting spirits of countless people along the way. "People come up and say thanks for putting this here, now I have pride in the community. They didn't before," Blanco said. "Instead of just putting your name up you could put a whole piece up and not sneak out at night. Take your time with it, grow as an artist and see what you can do." To get involved or sponsor the project, visit https://beautifyearth.org.